A collaboration between Alexandre Birman and Pedro Lourenço could not be born a model of shoes truly unique and exceptional. So one of the most interesting news this spring summer 2012 we find the singular forms that once again surprise us, showing us how untrue that fashion no longer horizons to be discovered and continues to focus on the revival of the past. Forms more futuristic than the new line Pedro Lourenço it will be difficult to find anywhere else, let's see in detail. Alexandre Birman has made a name in the fashion world especially thanks to the skilful use of snakeskin and python in particular, arriving at results very eccentric as we have seen commenting on the recent spring summer 2012, one of the most original of 'last year. From stilettos to wedges, the Brazilian fashion designer has created a series of small masterpieces in his last line, which is now added the most unexpected news badged Pedro Lourenço. The name will sound familiar forms, we speak of another Brazilian designer of only twenty-one who just recently signed another very interesting partnership, one with Melissa and according to even the first preview images of the collection, we really expect surprises interesting! These unique creations for Alexandre Birman include use of natural materials in addition to a bold aesthetic effect, we talk about shoes, for which daring and experiment were the teachings in the design phase. These sandals have inner sole red leather under which slide cylinders of wood in parallel rows which extend into the area of ​​the heel. Under the cylinders there is a plateau which significantly raises the height of the heel round, while the upper part provides tip open-toe, bands and rope from the tip that surrounds the neck of the foot and arrives at the ankle around which binds with effect from the slave, finishing with metal cylinders. The two versions are provided with a heel and peep toe in white, the other in black to match the most suitable character to look and maybe even looked for outfits, if you are bold enough in dress. 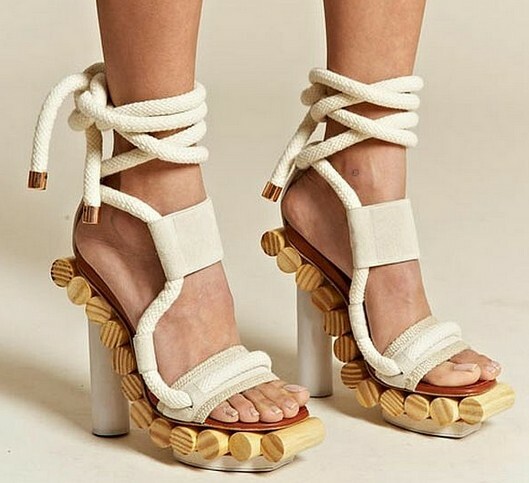 Not to mention that the use of natural wood and rope makes the perfect eco-friendly models, how they want the fashions of the moment so careful to protect the environment. The price of these babies to the very original moment is around $ 777, and we wonder which celebrity has the courage to show off first! What do you think?